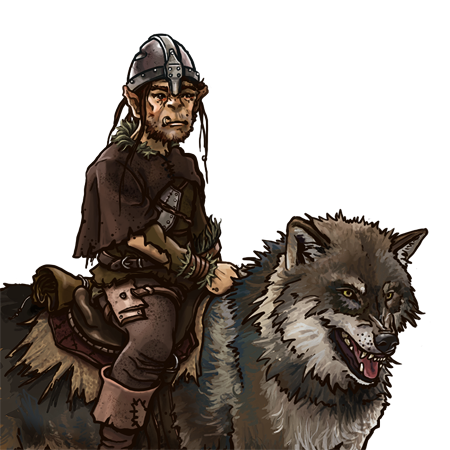 No one is quite sure how the practice of taming and riding wolves came into being, but the advantages of it for a goblin are obvious. Goblins are smaller and much weaker than their orcish kin, and are often tasked to the most dangerous and unwanted parts of a fight. Any who can manage to win themselves a mount have a much safer, and daresay, more amusing role in combat. Wolves, likely, could never support the weight of a man in plate, but a goblin in leather armor is a simple load to bear. Quite unlike horses, these mounts have a rather easy time traversing the mountains, though water and woods will still slow them down. Last updated on Fri Apr 20 12:32:23 2018.